In the first Modular Spaces episode we looked at wardrobes and closets. 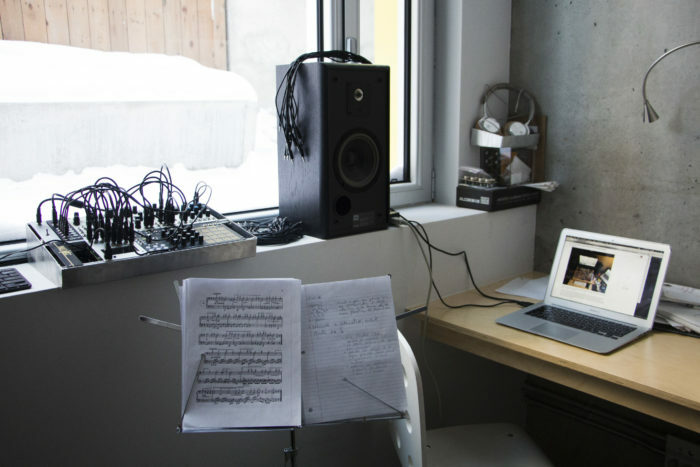 Spaces where music-making and the rest of life can be clearly separated when needed. In this new episode we’ll look at the opposite approach: here the musical space is part of a bigger whole. We’ll see corners, niches, slim tables beneath windows and instruments living on windowsills. Just like in the previous episode, our interest isn’t so much to just showcase tiny spaces, but rather to look into what people are capable of doing with the little space they have. We’ll see how they come up with strategies to make their spaces inspiring, efficient and harmonious and how they face the many challenges they are presented with. Jørgen’s space is definitely one that wants me to just get in there and make some music. There’s many things to love about it: the big window, the sunny atmosphere. And then there’s the plants! When setting up his little studio corner ,Jørgen wanted to get away from the dark rehearsal spaces he was used to. For his musical creation process, natural light felt more inspiring. “Since the studio is the place at our apartment where there is most light, it is also naturally the best place for our plants”, he tells me in the interview. The musical instruments and the plants go along pretty well. The combination makes for a cozy and harmonious location to make music in. 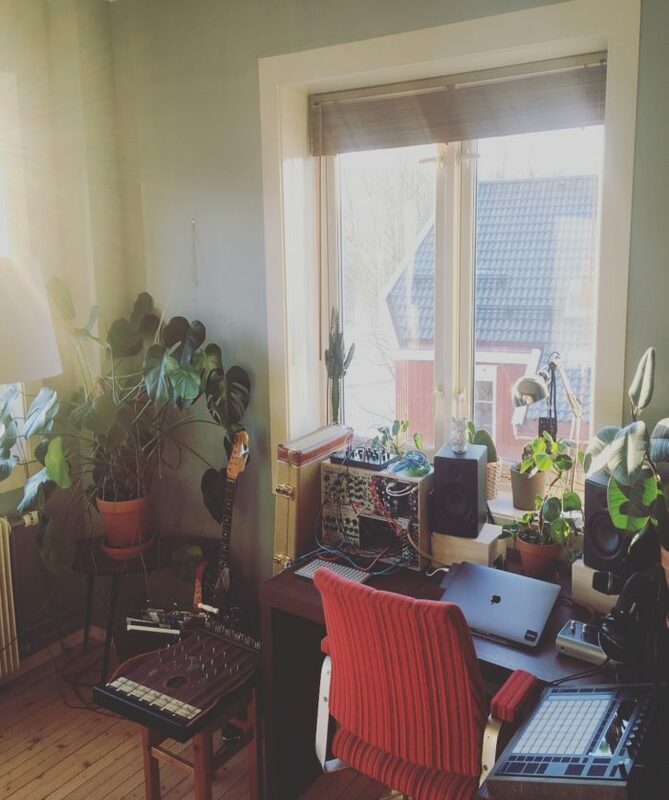 Since I first talked to Jørgen, he and his partner also started to grow tomato and chili plants: “I think their presence has somehow inspired some of the music that I’ve been making. It is very fun to see the plants grow from day to day”. This comes to no wonder, since plants and electronic music have quite a history (see John Cages experiments for example). His setup is quite varied. The modular synth, Ableton Live and a monome norns (a new entry) meet a Fender Jazzmaster and an old zither. The latter he particularly loves: “Goes in and out of tune easily, sounds as nice as it sounds horrific. Looks amazing”. Hallvard’s studio is located in the spare corner of his and his partner’s home office. The room is mainly used to pay bills and, more rarely, to work from home. 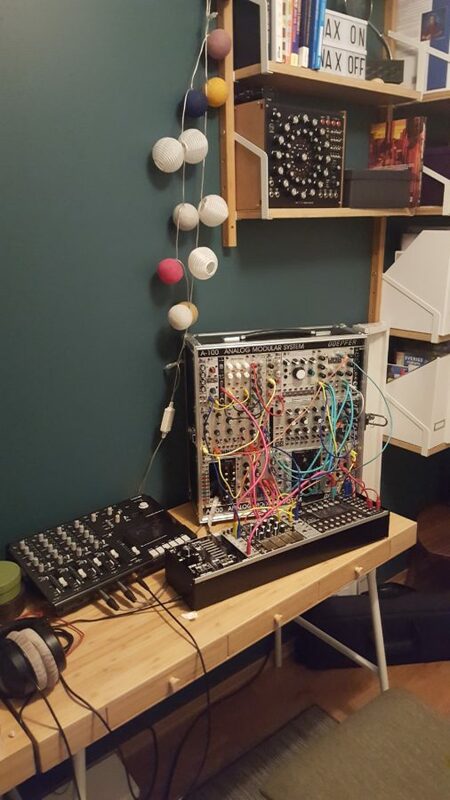 “After my office and synth room became our wonderful daughter’s bedroom in our previous apartment, we moved last year and the synth is back in a spare room. Feels great!” he tells me, and I secretly nod, I know that story all too well. “Less is more” seems to be Hallvard’s motto when it comes to making music: “The modular setup is sort of minimized from a larger setup which became overwhelming to me, since I normally only have an hour or so when I sit down with my instrument.” Being a Physicist working in research, his time for making music can be little, plus he likes to stay away from the computer and from having “too many options”. 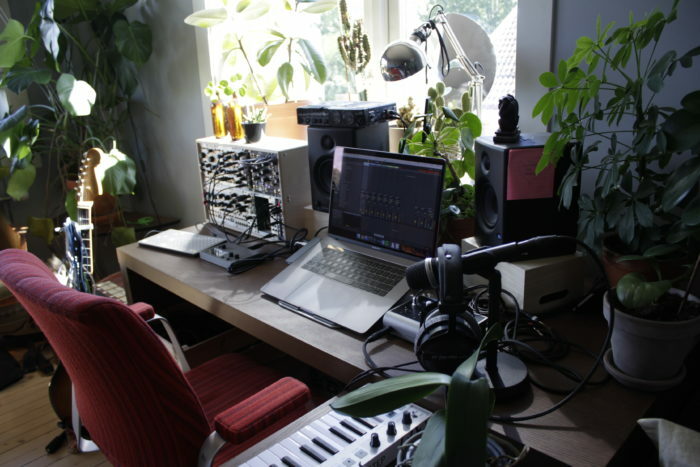 Hallvard began his journey into synthesizers with DIY MFOS instruments, his first synth was a MFOS Soundlab Ultimate and its companion sequencer, which can be seen on the shelf in the photo. Later Eurorack took over. Space restrictions, but also the power of available modules, were the main driving forces behind the shift. When I ask him if he ever dreams about having a big set-up or studio, he says: “I think I have been through the cycle of: first wanting more and more options/gear, then discovering what I really like and that I had too much, then reducing and refining my setup”. Apartments are pretty expensive in Oslo, especially if you want one in a central location, but Hallvard isn’t too bothered by the lack of space: “As long as I have a dedicated desk for it I am happy”. Still, he admits that if he was to move to a bigger place, he’d probably have a room just for synths, DIY and listening to music. His space looks cozy and inspiring, “I do this for relaxing, and out of a fascination and love for music and the technology behind it.” he tells me in the interview. Hallvard also likes to take out the Modular sometimes: “I have the portable Doepfer case, since I have jammed with some friends a couple of times, and portability is important to me even though it has been in that room now for a long while”. Simon went to Montreal to study Computation Arts at Concordia University. As most students who are away from home, he lives in a one-room apartment. His studies involve mathematics, programming and art, combining some of his great interests. Apart from that, he also plays the cello and the modular and more rarely guitar and piano. As you can imagine, fitting your life, passions and studies into one room isn’t easy. “The principal annoyance I had with using the same, small space for everything is that some things can’t happen concurrently” Simon tells me, but that’s not the only problem. Fitting even just a few things in such a tiny space can be a challenge. One must be open to accept compromises: “The desk was too small for both the computer and the modular, so I had to put the modular next to the window, between the speakers: this meant speakers were on my side when I used the computer, and that I was too close to them when I used the modular”. He’d love to keep the cello set up, out of its case, ready to play, but there’s just no room for that, “Being able to take short breaks off studying that way would have been fun.” Instead he uses the modular during the breaks, and with interesting results I’d say. The above piece is a recording made in preparation for his first modular live performance: A quadrophonic piece he played at his University. It combines a synth voice (playing harmonic variations of a sequence) and a chopped-up recording of a previously-recorded piano improvisation. The modular has been an interesting challenge for Simon, who comes from an acoustic-instrument background. “I was searching for the level of expressiveness and instant control you get playing an instrument you’re familiar with” he tells me, “What worked well was expressiveness through timbral control; I knew my modules and sound synthesis concepts very well, making this easy and highly rewarding”. Yeah maybe. But then, I don’t think they are intended to be recording or mastering studios. I don’t think you necessarily need great acoustics for making music and having a good time at it. Which is not to say that acoustics don’t matter, but it’s easy to put too much emphasis on such things, and forget what really matters. You can also do a very decent job with a nice pair of headphones. Yep – I don’t even have speakers in there. So everything happens with headphones.